Herbs and spices play an integral part in learning how to cook. Developing a spice collection takes both time and money. Spices tend to be somewhat expensive and some spices are a lot more expensive than others. Below is a very basic beginner spice list that will be be a good start to your spice collection. 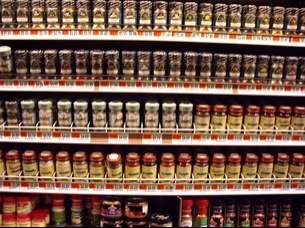 The spice section of the grocery store is the ONLY section of the grocery store that is alphabetized. It’s a good thing they are in some sort of order, because there are hundreds to choose from. Eventually you will be buying a lot more spices depending in your own personal tastes. (Some of the more popular spices used today are allspice, cardamom, cloves, ginger, mace, nutmeg, paprika, saffron and turmeric. Also, Spice blends, like curry powder, chili powder, garam masala, pickling spice, cajun seasoning (Bam! 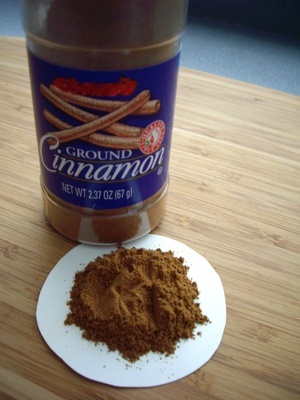 ), and pumpkin pie spice). For now, start with these six listed below. The course of history has been altered by salt. Wars have been fought over it, and many books have been written about it. Once considered an extremely expensive commodity, it is now probably the least expensive spice you can buy. The grocery stores sell a few different forms of salt. Gourmet specialty shops sell really exotic salts. Buy a box of “Plain Salt”. It usually comes in a cylinder shaped box. You will use salt in just about everything you choose to make, both sweet and savory. White or black pepper is sold either pre-ground or as pepper corns which need grinding. Peppercorns also come in red, pink, and mixed. Freshly ground pepper corn is great, but it does require investing in a pepper mill. At my local kitchen shop, grinders range in price from $20 to $100. That can be a steep investment for someone just starting out! My advice is…if you can afford it…go for it! The grocery store does sell inexpensive, non-refillable grinders, but they produce a very course uneven grind of pepper. If you do not have a pepper mill and do not want to invest in one, buy ground black pepper. 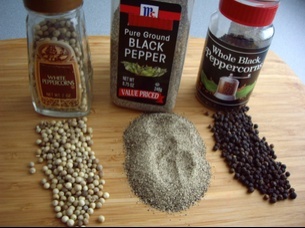 Do keep in mind that fresh ground pepper has a much stronger taste then pre- ground pepper. We often associate the herb oregano with Italian foods, but it is also found in Mediterranean and Mexican foods. You can buy oregano dried or fresh in the produce section of the grocery store. If you are using fresh herbs instead of dried the ratio is 3 to 1. So if the recipe calls for 1 teaspoon of dried oregano, you would use 3 teaspoons of fresh oregano. 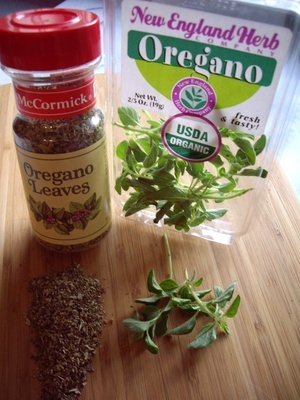 When using dried oregano, crush it between your finger tips as you add it to the recipe. This will help release the aroma and flavor. Adding a pinch (literally what you can pinch in two fingers) to a jar of store-bought spaghetti sauce makes all the difference in the world to the flavor of the sauce. Sprinkling a bit onto pizza will give it an extra ‘zing,’ and it’s great on garlic bread. Garlic and onion are two flavors that occur over and over again in all cooking. Granted, the fresh form is wonderful but the dried powder works brilliantly on things like roasted potatoes and sprinkling on grilled meats and fish. That said, my first preference is to always use the real McCoy! I have written extensively as well as made videos on fresh onions and garlic. The only way a beginner cook can develop confidence working with onions and garlic is…practice, practice, practice! In due time those skills will develop but until then, a recipe for roasted potatoes (for example) may be far less intimidating to try if the only skill required is for you to wash and cut the potato and measure in some spices. 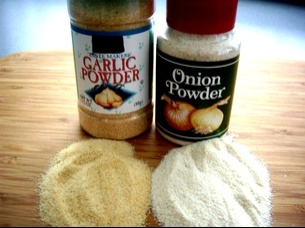 At the grocery store, be sure to get the garlic powder and onion powder, not the garlic salt, or onion salt. It’s better to add your salt separately. Nearly everybody likes cinnamon! Mix it with a bit of sugar and have it on your toast in the morning. Sprinkle it on your coffee or hot chocolate, or add it to oatmeal. Once you actually start cooking you will be amazed at how many savory dishes it can be added to. It adds a lot of interest to stews and curries, as well as ground beef. For now, that’s it. It only takes six different spices to spice up your life! I would love to hear what my readers, who are experienced cooks, think the next six should be for a beginning chef! Not to be a contrarian, but I think a pepper mill is an important part of a ktichen, and since they now sell peppercorns with a pepper mill built into the container, it is easy and (in the short run) inexpensive to buy a pepper mill. The oils in peppercorns are very volatile and break down quickly once the spice has been ground. When you buy ground black pepper, you are guaranteed to get a spice that isn’t worth the money you paid. If people are to really enjoy cooking and appreciate what they cook, they should use freshly ground black pepper. I know the point of this blog is to get beginers to appreciate how easy it can be to cook, but buying the peppercorns in the container with the built-in spice mill is easy enough, I would say. For the next six, I say basil, thyme, cayenne (because if you like a little heat, it can really be a versatile spice), ginger (now you can cook Chinese! ), and that’s about it. I personally like to use fresh herbs mostly and add them at the end of the cooking process so they become incorporated but don’t break down. My advice on herbs is to get a strawberry pot and grow them either in the house or on a porch or deck. You can grow very nice herbs ona windowsill. Oh, where to start with this one? I think what your essential herbs and spices are is extremely culturally specific. For example if this blog was aimed at an audience from the Indian sub-continent the essentials would include turmeric, cardamoms and a whole other host of spices, whereas my good friend who is vegetarian was telling me she never uses thyme because it is a ‘meaty’ herb. So what would I add? To begin with I don’t think I have ever used onion or garlic powder, but always use dried mixed herbs (thyme, marjoram, sage, parsley and oregano), Herbs de Provence (thyme. rosemary, basil, marjoram, oregano, tarragon) and bay leaves. Apart from that some chilli powder and pre-chopped chilli which lives in a jar in the fridge, paprika, turmeric (great added to rice) and a nutmeg. As was mentioned in a previous post, some herbs such as oregano are I believe actually different in their dried and fresh state and I would for example always use dried oregano in a tomato sauce as it has such an intense taste. Anguilla once had an active salt trade and in fact provided much of the world’s salt. I had been using local sea salt because of the minerals, but at a recent cooking class at Cuisenart Resort, I was surprised to learn that one must never cook with sea salt. Due to the mineral content, it takes longer for the salt crystals to dissolve and your test taste will be deceptive. By the time you’ve added enough salt to your taste, the dish will be too salty when it is completed. 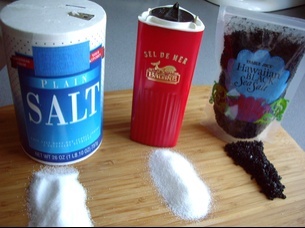 Instead, use plain table salt or kosher salt (my favorite) for cooking. I never use garlic powder or onion powder. I do use dried dill weed, celery seed, and marjoram. Thanks DBK, Jon, Bethany and Ginny for helping to develop this spice list! DBK-You are right, freshly ground pepper is the best! But it does require investing in a pepper mill. At my local kitchen shop, grinders range in price from $20 to $100. That can be a steep investment for someone just starting out! My advice isâ€¦if you can afford itâ€¦go for it! The grocery store does sell non-refillable grinders but they produce a very course uneven grind of pepper. As for cooking with ginger, thatâ€™s where I totally stick to using only fresh. I would love to be able to grow fresh basil, and thyme on my window sill but I am notorious at killing all plants! startcooking.com covering many different cooking styles (ethnic, baking, vegetarian, raw, vegan, etc.) Until then it will have to be just the (American?) basics! As far as onion powder and garlic powder are concerned, my first preference is to always use the real McCoy. I have written extensively on onions and garlic and have a video in the works for both. I have also spoken to numerous people who are just learning how to cook. Getting the knack of working with onions and garlic is not as easy as you might think. In due time those skills will develop but until then, a recipe for roasted potatoes (for example) may be far less intimidating to try if the only skill required is to wash and cut the potato and measure in some spices. For something like garlic bread, it is essential to use the real thing! I agree with Jon Sacker, the list is very limited to a certain demographic. For one, I always include cloves, turmeric and caraway seeds.